Eighteen years ago, on my first visit, I fell in love in Bermuda—and with Bermuda. I own. I’ve walked past and through the garden moon gates found throughout the island . . . hoping to be blessed with the good luck, that as the legend has it, is given to all who walk through. It’s funny how a dish sometimes embodies a physical place in our lives. These Dinnertime Donuts, with their moon gate curve and Bermudian rum–laced bacon jam, are an inventive tribute to an island that means so very much to me. In the bowl of a stand mixer fitted with the dough hook, combine the milk, sugar, and yeast. Let the mixture rest for 10 minutes, until the yeast starts to foam. In a medium mixing bowl, whisk together the flour and salt. Add the flour mixture, butter, and egg yolks to the yeast mixture and mix on medium speed for 3 to 5 minutes, until the dough comes together and forms a ball. Cover the bowl and let the dough rise in a warm place for 1 hour. Grease a large baking sheet and set aside. Transfer the dough to a lightly floured work surface and roll out to 1⁄2 inch thick. Using a 2- to 3-inch donut cutter (you can also use a drinking glass or biscuit cutter to cut out your donut rounds, and a plastic bottle cap to cut out the holes), cut out the donuts and transfer them and their holes to the prepared baking sheet, spacing them 1 inch apart. Spray the tops of the donuts and the holes with nonstick cooking spray and cover loosely with plastic wrap. Let the donuts stand in a warm place for 30 to 45 minutes, until they have almost doubled in size. In a deep-fryer or Dutch oven, heat 4 inches of oil to 350 ̊F. Line a baking sheet with paper towels and set aside. Working in batches, fry the donuts and donut holes for 1 minute per side, until they are a light golden brown color. Transfer to the prepared baking sheet. 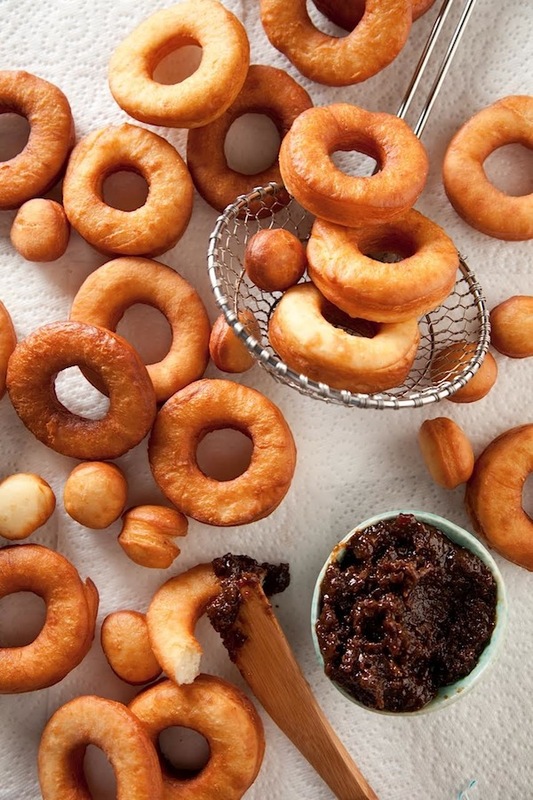 Serve the donuts warm with the Moon Gate Bacon Jam. reserve it for another use, leaving the rendered fat in the pan. Add the shallots to the rendered fat, return the pan to the oven, and cook the shallots for 10 minutes, or until they turn dark brown. Remove the pan from the oven and stir in enough rum and brown sugar to barely coat the shallots. Stir in 1 cup of the stock and return the pan to the oven to simmer for 15 to 20 minutes, until the mixture begins to thicken. Working quickly, add 1 cup of the remaining stock to the jam and continue to simmer in the oven for 40 minutes to thicken. Remove from the oven and stir in the cayenne and the remaining stock. Salt and pepper to taste. Carefully pour the mixture into a blender and puree until smooth. Pour the pureed mixture back into the hot pan and return the pan to the oven for 30 minutes, stirring frequently, until the jam turns a dark, earthy color. Remove from the oven and stir in the butter. Let the jam cool slightly. Use sparingly. Moon Gate Bacon Jam is very rich and flavorful—a little goes a very long way. Cook’s Note: Dinnertime Donuts are meant to be a savory dish, but if served with a sprinkling of powdered sugar or simply dipped in chocolate frosting, they make the breakfast table smile. When serving the donuts as a savory, remember the Moon Gate Bacon Jam is a labor of love and is not to be overused. One donut requires a mere “toe in the water” using this jam.